We thought some of you might be interested in a little non-bass related “behind the scenes” of our Belair Studio and Workshop. We are passionate about the environment, and as a result we’ve always been very interested in renewables and recycling. 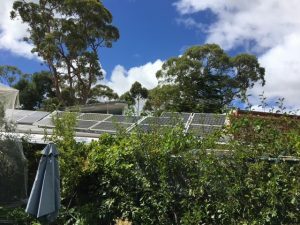 We were early adopters of solar voltaic panels and solar water heating and for many years now BassWorks has been running on sunshine. Our workshop is all electric and entirely powered by the 3kw roof system. We also have electric bikes, tools, mowers, chainsaw etc and look forward to the day when an electric van is affordable, practical and available. If you’ve visited us you might have noticed that we love gardening. A lot of our food is grown in the BassWorks salad bar. 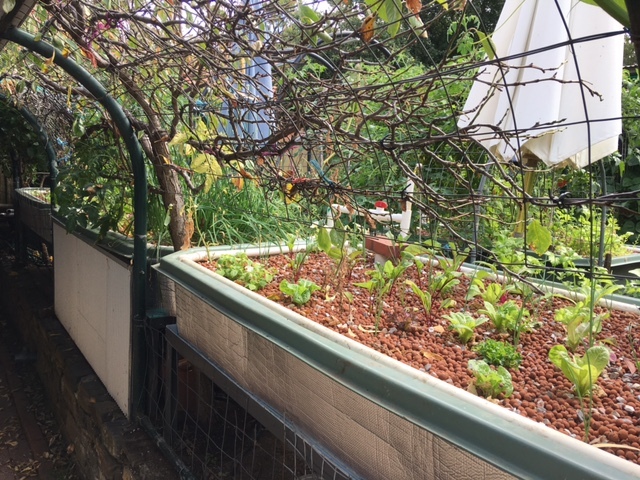 This is a backyard aquaponic system which does a great job of producing fresh fish (rainbow trout at the moment) and copious amounts of veggies. Once again running on sunshine and fish poo. Green leafy veggies such as lettuce and spinach thrive, and the tomatoes in the system are producing an excellent crop. One of our double bass customers is a bee keeper and for a year he left a hive here. It was amazing to see what 40000 eager little pollinators will do for the garden. 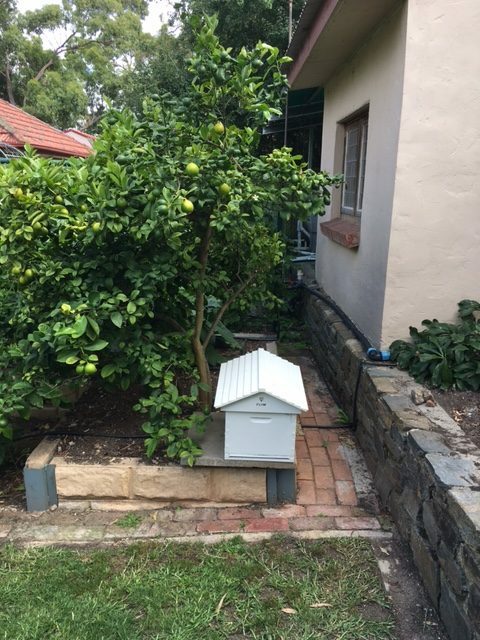 So we now have our own hive and it is amazing to watch the development of the bee colony. We are looking forward to some honey sometime in the future. 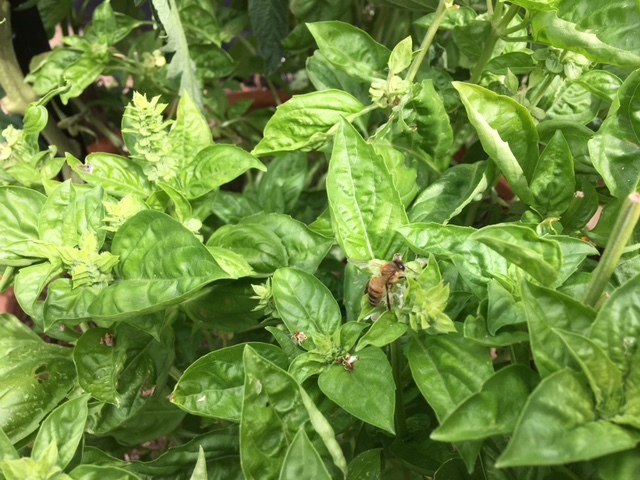 One of the bees hard at work in the Basil and the new Flow Hive below. There is much unnecessary controversy about climate change and regardless of opinions one thing is clear; If you poison your environment with chemicals, you and the life around you will suffer. We’ve always had the long-term goal of reducing our impact on the environment, and maybe even improving things, and we hope you’ve enjoyed this insight into a bit of what is important to us. Next time you stop by for an appointment feel free to check out the garden if you’re interested. 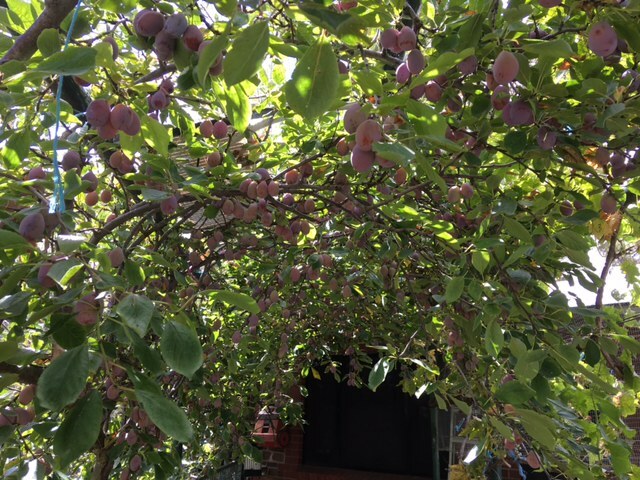 If you come by in the next few weeks you can help yourself to a sneaky plum or two as you walk down to the studio. They’re delicious at the moment! This entry was posted in Blog and tagged aquaponics, Bassworks, gardening, solar energy on February 19, 2017 by Pete McLachlan.